Lovin' me some Flopsey! This is gorgeous, Denise! Love your take on the sketch! This has spring written all over it! I so wish it was spring here!!!! I love this card Denise! What size are your cards normally? I love the scallop edges at the top! Denise...you colour with such a soft touch...WHICH I SO LOVE! I need to learn that style! This is so cute Denise. Love the design. This is so sweet. I love how you let the kite fly off the side of the main image..Great job.. Awesome coloring on this one, and the bling on the sentiment looks perfect. I love that kite floating out of the box!! I love bunnies and this one is sooo cute. Your card put a smile on my heart! Aw! How sweet!! 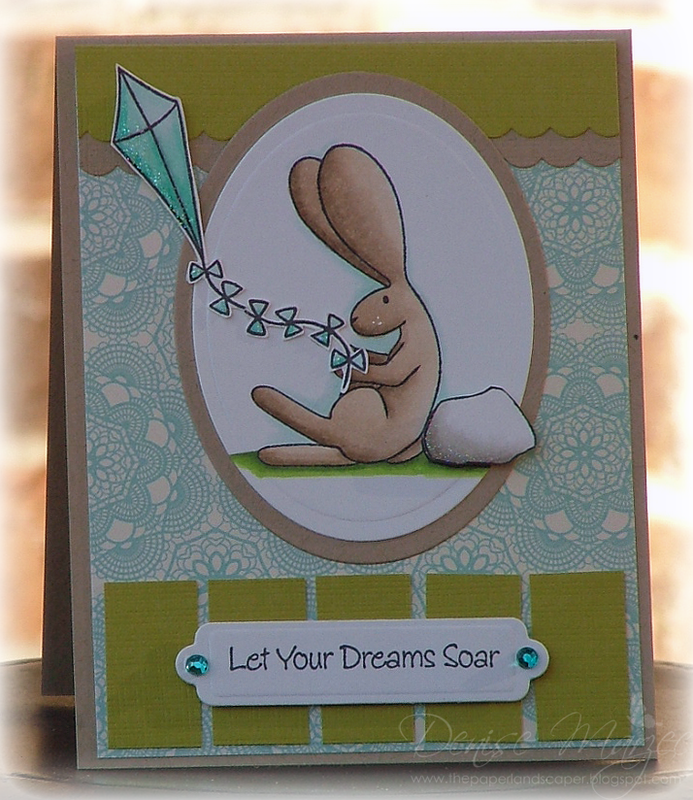 Love the sweet bunny and your aqua and olive color combo. Gorgeous design and layout! Your Flopsey is just darling, and colored so beautifully!! I love your kite as well!! So sweet Denise! Happy New year!!! How CUTE is this!!!! Love the kite flying out of the oval and of course you colouring is stunning as always!! I LOVE the kite being out of the image and popped up. Gorgeous shading too. Super A-DORABLE!!! Such a sweet and happy card. You've inspired me to pull out and use a Flopsey soon. So cute! Lovin the colors! So fresh and cute! I love it! Congratulations your project is being featured on the MFT Blog today as part of Our Favorite Finds! 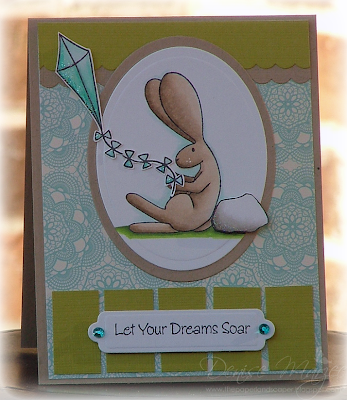 congratulations on being featured, love your card, its gorgeous!